everything behind, yet vacation in luxury. main floor along with full bath and laundry room. chairs for reading and relaxing. This level also contains a full bath. and poker table. From the bar, mosey on over to the "State of the Art"
eight-person hot tub located on a separate, covered deck. 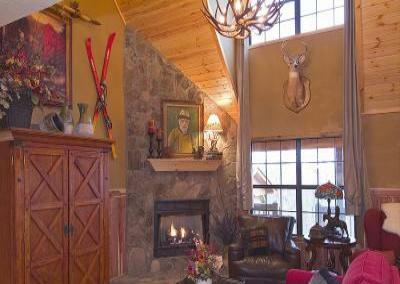 Buckhorn Lodge will always welcome you back. sleeper sofas )and 3 baths. Comfortably sleeps 2-16 people. DVD, with play station and games. and rustic 10 person table. TV, smoothie machine and games. with top of the line Yamaha surround sound system. * Other TV's, one each 32", 27", and 20". * High speed internet access.